For Italian Americans, a Perillo Tour is a great way to get to know your roots. Walk the streets your grandparents walked, visit distant cousins, dive deep into your genetic pool. 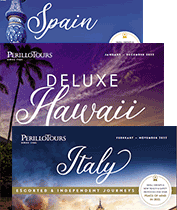 While a Perillo Tour is a structured vacation, you can make time to visit the towns of your ancestry by flying into Italy early or extending your tour at the end of your Perillo vacation — and we’ll be happy to help you make arrangements. If your family lives near a scheduled Perillo Tour stop, you may even be able to fit a visit into the tour itself. It is often possible to determine where your Italian ancestors were from – and where your relatives might still live – from your surname. Prefixes like "di", "da", and "la", can also shed light on the history of your family. Of course, your Tour Guide will be happy to discuss the subject further and help wherever possible. Ancestry is a favorite topic for many Italians, as is discussing just about anything. Patronyms – son of: The prefix di, meaning ‘of’ or ‘from’, is often attached to an otherwise ordinary Christian name to form a patronym. di Benedetto (for example) is the Italian equivalent of Benson, di Giovanni is Johnson, and di Miceli is Michaleson. Most interesting is the fact that such patronyms often derive not from the name of a paternal ancestor, but from a favored saint or religious figure. Saint Dominic, for example, the founder of the Dominican order, gives us di Domenico, Didomenici, Menico, Menicossa... dozens of related patronyms. Location: The prefixes da and di also mean ‘of’ or ‘from’, but are most often associated with the place of origin. Examples include da Vinci and di Napoli. These names often evolved from a nickname for someone who was from a place, but no longer lived there – di Napoli might have lived in Rome, for example. Nicknames: The prefixes la and lo mean ‘the’, and names with these prefixes were often derived from nicknames. Giacomo la Greca, for example, means Jimmy the Greek. In the mid 19th century, the prefix was widely attached to older names in Sicily where it meant "of the family of." For example, the Licata family became la Licata, and the Greco family became lo Greco. Over time, the prefixes could often be dropped again, or sometimes combined to become a single name, like Dimiceli, or Diliberto. Siblings might go through their lives with different versions than each other; some people change them seemingly willy-nilly from one document to the next.